Description: When investigating a number of strange robberies, it suddenly occurs to the criminal investigative team of Robert Mortis and Doug Bigelow that some of the corpses in the morgue are returning customers. When talking about cinema in the 1980's, it's no secret that a defining genre of the decade was the buddy cop comedy. A rag-tag duo of a serious by-the-book cop and his wisecracking partner with a heart of gold trying to stop some larger than life crime organization from whatever plot they have in the work is a pretty easy frame to put in whatever gimmick you'd like to. Normally it would be something easy for the audience to latch on to, like K-9 where a no-nonsense cop is paired with a dog who has a major attitude problem. 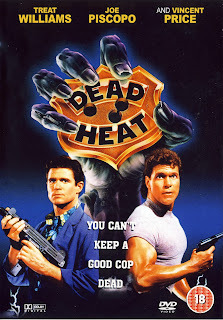 The all-time greatest showcase of buddy cop movie conventions (as well as other urban crime action movies) would later show up in The Last Action Hero starring musclebound hero Arnold Schwarzenegger coupled with a movie-loving loudmouth kid. But enough about that, this time we're looking at Dead Heat. 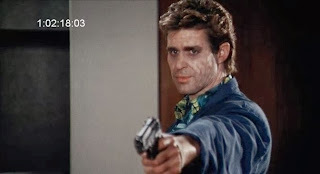 Combining all the well-known clichés of the buddy cop movie with a zombie movie is a pretty unconventional move indeed, which is probably why this particular feature didn't receive much of a commercial success and only a limited international release. This can most likely also have something to do with the niche-nature of the zombie "genre" at the time of the movie's production. While zombie movies were certainly around at the time, Hollywood didn't think much of it and the movie was made long before it became basic practise to copy the kind of zombies (now considered classic) found in George A. Romero's Zombie series. No, these zombies are nothing like the zombies found in pretty much any other zombie movie. For starters, the zombies in this film retain their personality from their past lives, and the (limited) gore in the film comes less from epic fight scenes and more from a fault in the resurrection process. It's actually kind of fascinating to see something this different from the usual kind of mindless brain-munchers that show up in most modern media. No offense to the classic type of zombie, though you'll find no overwhelming hordes in this film. Unfortunately the movie does have it's faults. Easy to recognize badly done stage falls, poor comedic chemistry between the two main characters and little to no actual character development are among it's most criminal offenses. Now, the actors are actually fair enough but they seem to be phoning in their performances, probably because of little regard for the material they're paid to deliver. The movie is also very "safe", throwing in a sudden action scene when movie's producers must've felt the audience was about to fall asleep. This wasn't a very popular genre at the time, so the fact that the writers felt the need to explain everything in the universe as quickly as possible must've been an attempt to at least have audiences keep up with the concepts. I'm not saying the movie is not entertaining, but unless the setup of the movie tickles your fancy to begin with, there is not much here besides spectacle. Boy is there ever spectacle, in a move that I have scarcely seen repeated in other movies, the resurrection technology appears to also work on animals. I'm not saying where this comes into play, but if you love over-the-top goofball spectacle this is worth a watch for that particular scene alone. If you like zombies and you want to see a very different kind of zombie movie, this could be it for your movie night. The buddy cop element of the movie may not be very good, I'd say average compared to other films in the sub-genre, this manages to at least hold your attention while the story is told. Perhaps with a cast that actually had an interest in the parodied material, this could have been a truly great comedy. As it is though, it makes for an excellent excuse to eat popcorn and enjoy those 80's special effects. Personally, this stands as somewhat of a "guilty pleasure" of mine, and if I could choose one movie to give another shot, this would probably be it. This movie was just not made for the era it was produced in, and perhaps a modern crew with more experience with the zombie genre could do the concept justice.